So, this "World View" page was effectively my blog -- until I entered the world of social media, at which point Facebook became my platform of choice... So this page looks more like an archive. Poke around to find links to some great travel photos, and essays on various topics. Cabo San Lucas is a lovely spot on the tip of the Baja Peninsula. We flew down and stayed six days there! Our hotel was THE closest to the official "Land's End": we could walk, including a couple of sandstone rock scrambles, from the Pacific side, where the waves were huge and too rough to swim in, to the Sea of Cortez, where there was a famous swimmable beach that most tourists went to only by boat. Further northeast, in town, was the main large beach where most people swam. The town appears to be built solely around American tourism. It's a very remote location at the end of a long desert. We were told that the resorts use desalination plants to convert ocean water for their water. (The upside of that is that the water is safe to drink, unlike most of Mexico). I'm not sure how electricity for the area is generated. There are a HUGE number of enormous resort complexes along the coastline for miles. The whole place is a tourist trap, and prices were pretty inflated -- no cost savings like you would find traveling through rural areas -- but because it is such a huge boost for the region's economy, the place is protected and safe to walk around in. The locals, while a bit pushy in selling their wares and services, were friendly and seemed appreciative of the business Americans bring. I imagine some tips alone were a huge amount compared to the average wage in Mexico. We did go to some great restaurants -- fun with lively ambience -- and the seafood was amazing, especially the shrimp and lobster! :9 The Sea of Cortez is rich with marine life. There is a large Marina in the middle of town, and watersports and fishing are a main attraction. We went snorkeling (by boat tour, to a beach away from the city), parasailing (making us unfortunately very nauseous! ), and horseback riding, and I did some swimming at the famous Lover's Beach. It was the first time I had gone swimming in the ocean for at least ten years. The water is warm! View a slideshow of pictures here. In June I threw a fun party with a partial reunion of the band Five. Here is an audio sample. 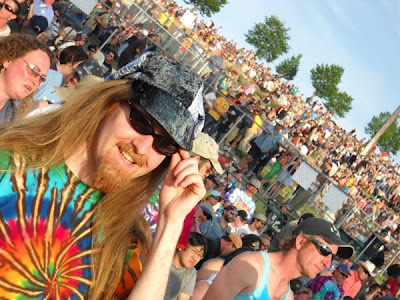 The next trip was to the incredible Rothbury festival in Michigan on July 4th weekend: 4 days of music in a rural setting, including the Dead, String Cheese Incident, Bob Dylan, Willie Nelson, Zappa Plays Zappa, and most of the top national jambands. Over 30,000 people were there. And of course, Phish at the Gorge -- almost 20 years after I first saw them in '89 -- sounding GREAT and pulling out rare old classics! Outdoor excursions were pretty light this year, but we got some good hiking and camping in late in the summer: a hike along Cheeney Creek in the Salmon-Huckleberry Wilderness near Welches, and a long weekend of camping and exploring the Indian Heaven Wilderness in WA west of Mt Adams. We got some great rafting in on the Clackamas again too, and during the big 107-degree heat wave(! ), I finally found relief on the beach in Astoria where it got below 70 (ahhh...). The last weekend of summer, I played a wedding at spectacular Smith Rock State Park and we explored the Bend area over the weekend. Here are pictures and two short videos of the Dead at Shoreline and the Gorge. Here is an interesting article about the parallels of the current economic and environmental collapses. Just as a few lonely economists warned us we were living beyond our financial means and overdrawing our financial assets, scientists are warning us that we�re living beyond our ecological means and overdrawing our natural assets,� argues Glenn Prickett, senior vice president at Conservation International. But, he cautioned, as environmentalists have pointed out: �Mother Nature doesn�t do bailouts. I'm finally on and exploring Facebook. (Honestly, the name Facebook made it sound unappealing...) I can immediately see that it is more social and interactive than MySpace. I also like the absence of flashy layouts and how that puts the emphasis on content. I'm seeing people increasingly direct their attentions to Facebook from MySpace. Hit me up and write on my wall! If one wants to make a personal and effective sacrifice that would help tackle climate change, as well as greatly reduce their impact on the environment, people should have [at least] one meat-free day a week, according to the world's leading authority on global warming. This is essentially why I stopped eating beef and pork 20 years ago: the environmental impact of the livestock industry is immense, on several fronts. Diet change is important because of the huge greenhouse gas emissions and other environmental problems -- including habitat destruction -- associated with rearing cattle and other animals. Vast amounts of water, grains, and fuel are used in production. The UN's Food and Agriculture Organisation has estimated that meat production accounts for nearly a fifth of global greenhouse gas emissions. These are generated during the production of animal feeds, for example, while ruminants, particularly cows, emit methane, which is 23 times more effective as a global warming agent than carbon dioxide. More about meat will be forthcoming. Read the article on CNN.com for a concise overview of the waxing and waning of the environmental movement over the last 40 years. A "National Debt Clock" in NYC recently run out of numbers as the national debt exceeded $10 TRILLION dollars. That's $10,000,000,000,000. Below the figure of the total debt is the figure estimated for "Your Family's Share". It's currently over $86,000. When people call us the richest country on the planet, it seems to me that this is not being considered. Let's say you run up $500,000 on your credit card. It would LOOK like you have a great standard of living. What happens when you have to pay the bill? What's going to happen to our country? Interest on this debt alone will become a significant part of the budget, and that's not even paying it off any. Whenever I hear rhetoric about "tax & spend liberals", I just want to hear someone say "well, that's better behavior than the borrow & spend neo-conservatives' sending the bill to our kids' generation and beyond". Absolutely shameful. I'd like to see a freeze on any more borrowing. Mandatory balanced budgets. Read the article about the National Debt Clock including public perception of it and the debt. Al Gore issued the challenge for America to convert 100% of its energy sources to carbon-free sources in 10 years. Very bold -- and optimistic. Watch a video or read the transcript of his moving speech at the wecansolveit.org website, which is the hub for the We campaign, a project of The Alliance for Climate Protection, a nonprofit, nonpartisan effort founded by Al Gore. Go Al go! I wanna be part of the solution too!!! The Sierra Club (and now myself) has officially endorsed Senator Barack Obama for President. Here's why. Simply put, it's because we believe Obama shares our concerns, values and vision for a clean energy future. He agrees with us that it's not time for half steps, and that what America needs is bold, transformational action that will break the chokehold Big Oil has on our economy and Washington politics, and provide short-term relief for American families and long-term solutions for our energy and economy problems. Providing Relief for families struggling to pay their energy bills. His plan is to provide families with a $1,000 tax credit and stimulus checks paid for by taxing the oil companies� record profits. Investing $150 billion over the next ten years in alternative sources of energy -- wind and solar power, and advanced biofuels, in the commercialization of plug-in hybrid cars, and development a new digital electricity grid. This investment will create up to 5,000,000 good-paying jobs that cannot be outsourced and will create the billions in new economic activity that will America back on the path to prosperity. Attacking global warming. Obama has presented a bold and comprehensive plan for addressing global warming which includes a "cap and auction" system that would cut our carbon dioxide emissions 80 percent below 1990 levels by 2050. Thanks for everything you do to protect the planet. This content excerpted from a message from Carl Pope, President of the Sierra Club. If you are like me, you dislike junk mail. It's a waste of paper and ink, and it includes gross images of meat and crap. Next time you get the usual load of crap in the mail, consider looking up the sender online and request that they suppress mailings to you (often through their "Contact" page). It just involves a simple form which doesn't take long. I went to www.valpak.com and www.valassis.com to remove two regularly-delivered junk bundles. Converting organic waste into oil: Thermal Conversion Process (TCP). This new technology takes organic agricultural wastes and converts it using heat and pressure into diesel and fertilizer. Amazingly, the process can run mostly on the fuel it creates. See the website of Changing World Technologies. Algae as an energy source. Up to 50% of algae's weight is oil which can be used to make biodiesel usable as fuel for vehicles. Algae grows much more quickly than many plants and can be grown in artificial environments (unlike corn, for example). New methods have found much more efficient ways to grow algae. It's estimated that about 100,000 gallons of algae oil a year per acre can be produced, compared to about 30 gallons per acre from corn and 50 gallons from soybeans. Here's an article about it. That's right. In the "land of the free", as of the start of 2008, 2,319,258 people -- more than 1% of the adult population -- are either in prison or jail. That's more than ever before, and a higher per-capita rate than any nation. On average, the annual cost per prisoner was $23,876, states spend 6.8 percent of their general fund dollars on corrections, and Oregon had the highest spending rate, at 10.9 percent. Oregon is one of four states which now spend more on corrections than they do on higher education. While one in 30 men between the ages of 20 and 34 is behind bars, for black males in that age group the figure is one in nine. These facts were included in a report released Thursday by the Pew Center on the States. You can read the article on it found here. Photos taken in Rome are finally online! Okay, so it took me nine months to publish... It took a while to pick the best ones, and even after weeding out the majority, there are over 150 here! Click here to open the gallery in a new window. Tip: click on "Slideshow" found on the right side of the page. Additionally, photos of Siena and Chiusi were added to the Tuscany gallery. In the North Pacific is a "Great Pacific Garbage Patch" or "trash vortex" in which about 100 million tons of plastic are circulating, concentrated in a sort of "plastic soup". The area is TWICE the size as the continental United States(!). The "Patch" is actually two linked areas, either side of the islands of Hawaii, known as the Western and Eastern Pacific Garbage Patches. About one-fifth of the junk � which includes everything from footballs and kayaks to Lego blocks and carrier bags � is thrown off ships or oil platforms. The rest comes from land. While it is held somewhat in place by swirling underwater currents, it does move, sometimes close enough to the Hawaiian archipelago to result in "a beach covered with this confetti of plastic". An oceanographer who has made the study of the patch his full-time occupation has said that it is set to double in size during the next 10 years, unless people reduce their use of unnecessary disposable plastics. It took me a long time to warm up to MySpace. It was depressing to see it take over the online presence of the live music industry, especially as an aspiring web designer wanting to do live music industry web sites. Most bands, and even many music venues, have given up having a real website in favor of the ease of working with MySpace. And, um, cause it's free. I eventually realized: I don't blame them. Web sites are expensive, labor-intensive, and often frustrating. And you don't really get the scope of outreach with website email lists, since most people won't get on them before they will become your MySpace "friend". MySpace has a become an indispensible networking tool for musicians. And since many musicians are poor, MySpace offers a huge service by offering a free, customizable home on the web where they may showcase their music and announce shows. I've hooked up with old friends through MySpace who probably wouldn't have found me otherwise. It's been frustrating, since I have the link to my website (and little else) on my page, to have people write and say "are you still playing music?" or "where are you playing next?" MySpace does not make it clear at all when signing up for an account that an artist's account is different from a regular account. I know several musicians who have signed up for a regular account without knowing and then found that they couldn't post music. Bulletin-happy people. Please, do not post several bulletins in a day and fill up my bulletin board. I am tempted to remove you from my friends. I do not want to read that you are bored. Wait until you have something to say. And consider putting it in your blog instead. Check out the first batch of photos from Italy. Oregon is going smoke-free!!!! FINALLY!!! Starting January 2009, smoking will no longer be allowed in bars!!! The Oregon Legislature and Governor quietly passed this into law last week! It's interesting that a ballot measure was not required...I thought it was going to come down to that, along with a big public debate. For me, this is the best news I've heard in a long time. January 2009 is going to be a good month: making history both reeky smoke-filled rooms and the reeky corrupt Bush Administration. Check back soon for fabulous pictures and stories! Don't believe the media's coverage of the peace march on March 18th. It was a mostly peaceful march of thousands of people showcasing a lot of nuggets of wisdom. The media thinks that they can create a more entertaining "news product" by covering the few bad apples who engage the cops. Sadly, coverage of the messages from the protests gets neglected. Have a look at my photos of the event. Click on the link below. Try the slideshow feature when you get there. I love comics and cartoons. I read Doonesbury religiously. Garry Trudeau really knows how to stick it to the man. I subscribe to Funny Times, a collection of lefty political cartoons. It's helped me to keep my sanity these last few years, (although sometimes a cartoon illustrates the insanity of a situation better than language alone could). Playing at and enjoying the Summer Meltdown in Darrington, Washington. WOW! What a great festival: so many great bands and acts! And what an incredible venue: just a few miles away are these mountains which shoot up over a mile of elevation! Thank you, Flowmotion, for producing such a fantastic event. I'll be there next year. Swimming and rafting on the Clackamas River. McIver Park is a great place to swim: it has these cool rock shelves which reach out into the river, then drop off into deep water. Camping on Mount Hood. Miki and I explored some great trails in the depths of the forest. I awoke one morning to the sound of a tree falling in the woods (it DOES make a sound! ), apparently naturally. Take the drive between Mount Hood and Hood River, too, and stop at Panorama Park just south of Hood River. Hiking on Cape Lookout on the Coast. South of Tillamook, this is a peninsula which juts out a mile or so into the ocean at a high altitude. The trail is really windy with a lot of character, and it traverses along cliffs on BOTH sides of the peninsula, offering SPECTACULAR views up and down the coast (see photo). I'm no longer a vegetarian and enjoy seafood, but I'm concerned about the state of the world's oceans and waterways. I started carrying a wallet-sized guide to the sustainability of different types of seafood, based on how environmentally-friendly the fishing practices are and the current levels of species. When I go to restaurants, I refer to this when making choices about what seafood is okay to order. The guide is produced by the Monterey Bay Aquarium. Look for the link to the printer-friendly version. Do your part to protect the world's oceans! I found the following somewhere and thought that it was pretty cool. Enjoy! Live simply and live deliberately. By choosing not to get caught up in the details of this fast-paced world, you are doing your part to slow down the world. You will also discover that you have more time to enjoy being alive. Stay in touch with yourself. Soul-searching, meditation, and journaling are just a few of the many activities you can take part in to stay aware and learn as much as you can about your emotions, reactions, likes, dislikes, dreams, and fears. Having a solid sense of self gives you a firm foundation for living in this world. Support or teach others as often as you can. This can help you form connections with people while also giving you an opportunity to make the world a better place. Consciously choose what you will allow into your being. The media bombards us with visions of hate, war, and pain. Be judicious about what you read, watch, and listen to. Acknowledge the beauty that resides around you. Whether you live in a sprawling metropolis or a stereotypical suburb, there are natural and man-made wonders just waiting to be discovered by you. Nurture your ties to your tribe. If you don't have one, create a community that you can belong to. Modern life can be isolating. When you have a tribe, you have a circle that you are a part of. Its members - loved ones, friends, or neighbors - can be a source of support, caring, guidance, and companionship. See the larger picture. Remember that the way that you choose to live is not the only way to live. Widen your perspective by exploring other modes of being through research, travel, and discussion. Embrace the challenges that life presents to you, and challenge yourself often. After a time, even the most exciting jobs or lifestyles can seem routine. Never stop assimilating new knowledge about whatever you are doing, and your life will never seem dull. Move your body. In this busy world, it can be easy to live a sedentary life. Movement reacquaints us with our bodies and connects us to the earth in a visceral way. It also restores our vitality. Make time for stillness, silence, and solitude. The world can be noisy, and we are subject to all kinds of noises nearly every waking hour. We are also often "on the go" and unable to relax. Being alone in a peaceful place and making time for quiet can help you stay in touch with yourself. This analysis finds that the House Budget Committee's budget plan is harsher than the Senate plan in several respects. The House plan would cut funding for domestic �discretionary� (or non-entitlement) programs by $8.8 billion in fiscal year 2007 and $169 billion over five years, relative to CBO's current-services baseline. The plan also would reduce entitlement programs by $5.1 billion over five years. The savings from these program reductions would not, however, be used for deficit reduction. They would instead be used to offset a portion of the cost of the budget plan�s $228 billion in tax cuts, as well as its defense spending increases. The net result would be significant further increases in the deficit. The plan would increase the deficit over the next five years by $256 billion above what deficits would be if current policy was left unchanged. For more information, see the full article on the Center on Budget and Policy Priorities web site. Compiled by the Campaign for America's Future. This morning oil giant ExxonMobil announced its record-breaking profits for 2005 to the public -- $36.13 billion! That is the largest profit made over one year ever recorded by any corporation in America. The failure to pay all of the punitive damages awarded to fishermen and others injured by the 1989 Exxon Valdez oil spill. In response, the ExxposeExxon.com campaign has created a short, funny video lampooning Exxon's unfortunate combination of huge profits and tiny social conscience. This web site also gives you an easy way to speak your mind on this issue via email to the powers that be. I feel so lucky to reside in the beautiful bubble which is close-in southeast Portland, Oregon. Full of eccentric artists, passionate lefty activists, and quirky culture, and highly livable-in without a car, it seems like the place for me. I take it for granted too much: I've lived here for years, and haven't spent much time away, so when friends and relatives visit, they remind me of the specialness of this place. I may not live here for the rest of my life (though I don't know where could be better), but I am happy here now. Sure, the weather is a drag sometimes, but with good friends and a lifestyle rich with cultural expierences, it's worth it. For me, the presence of cigarettes is by far the worst thing to have to deal with about the Portland music scene. I can't tell you how many times, at the end of a night, stinking and wheezing, I've told myself: "That's it! I'm moving to California!" I never followed up on that one, but it may come to that still. It was wonderful news about Washington's recent vote to ban smoking in all public places (effective Dec. 8, 2005). So now, California, Washington, Eugene and Corvallis are nonsmoking...but not Portland. I applaud some clubs' efforts to go nonsmoking (Berbati's, Doug Fir) or restrict smoking (the Goodfoot, the Blue Monk, Jimmy Mak's). I don't believe it's enough though. Many of my friends are smokers. To them, I ask for their patience in accepting this situation. In all fairness, I should not have to die young of lung cancer as a result of being a working musician. To those who say that it would hurt the scene because so many patrons smoke, I say: a high percentage of club patrons are smokers because nonsmokers won't frickin' go there. Studies have shown that after an initial adjustment period, business actually improves after a smoking ban. In the meantime, you can find a list of nonsmoking establishments in Portland at smokefreeworld.com's Portland page. Just renewed my membership to KBOO, the coolest radio station in the known universe. It's pledge drive now -- consider becoming a member! I'll miss the $40, but it is vitally important to me. In this age of media consolidation into the hands of a few giant corporations who control what news information (or lies) you get and what music you are exposed to, resources like KBOO are crucially important. It's been a great honor of mine to get to perform live on the air three times. Tune in often [90.7FM]. Because of its diversity, you won't like everything you hear, but there are many wonderful shows that play stuff you won't hear anywhere else. Impeach the bastards for their crimes against humanity and the world! One good thing about Bush's re-election: it gave us time to impeach the lot. Check out this grassroots campaign I discovered: "the world can't wait". Download their document "the call". Looks like November 2nd will be an interesting day. Also try this Google search for "impeach Bush"! hemp is a miracle plant which has many uses and offers an environmentally friendly alternative to petroleum and tree-based products. Hmm...d'ya think that that's why it was made illegal in the first place? Check out NORML and the MPP, organizations working to reform marijuana laws, and this hemp facts page. pot makes most people lazy. I walk, bike, or take Tri-met whenever possible. Portland's pretty set up for alternative transportation. Check out Tri-met's website. Their "trip planner" feature is pretty sweet: just type in where you are, where you're going, and when you want to depart or arrive, and it gives you different options. Sure, I don't get out of town much for recreation, and I have to bum rides for all my gigs, but I'm saved a lot of expense and stress. Eventually I may use Flexcar, a great new car-sharing service, or get a hybrid or biodiesel vehicle. I used to lament all the driving centered around touring with the Dead & Phish. I've not done much touring myself, and though I hope to do some soon, I'm not sure how psyched I'd be doing it full time. Some bands are doing it now with biodiesel buses -- vegetable-oil-powered! Portland, I read recently, is one of the only cities that has actually reduced greenhouse emissions, to levels seen in the '80s. Read a breakdown of numbers regarding the energy bill currently making its way through Congress. Brace yourself -- it's maddening. Cuts for education, environmental programs, and health care for poor people, but tax cuts for the rich and increases in defense spending. Larger budget deficits. Drilling for oil in the Wildlife Refuge. Welcome to the manifestations of Republican "moral values" as reflected in the 2006 budget. Have a look at the breakdown on the Center on Budget and Policy Priorities site. Stay informed about the latest outrageous attacks on the natural world -- your water, air, and land -- by the blinded-by-greed Bush Administration. The Sierra Club's W Watch gives a good overview. The Bush administration is using your tax money to produce pre-packaged, ready-to-serve television news segments promoting the president�s policies. Join thousands of people like me who are telling Congress, the FCC and local broadcasters to stop government propaganda. It only takes a few moments to send this important message. Soon there will be rants in here as well as raves. Prose and poetry. Hopes and dreams. Probably stuff that you didn't know that you wanted to know about me.